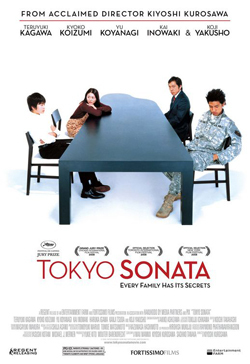 Tokyo Sonata is a movie that shows us a recent ordinary Japanese family. The Sasaki family appears in this movie. Ryuhei, Megumi, and their 2 sons make up the family. This movie starts with a tragedy of Ryuhei. He was working at a company, and he was a department chief. However, suddenly he was fired by his boss because the company decided to set up a new operation. Ryuhei did not talk about it to his family, and he pretended to go to work every day after he lost a job. Nobody in the family knows about his joblessness because he wore a suit and left the home typically. But Megumi who is Ryuhei’s wife saw him receiving a soup ration in a park. In this family, there were some problems other than Ryuhei’s joblessness. Both 2 children had what they wanted to do. The older son wanted to join the American military, and the younger son wanted to go to a piano school. However, Ryuhei disagreed with them, and he had a very strict authority in his family. Megumi had no opinion of it. Because of the dictatorship of Ryuhei, the family started to break up. This movie has no happy ending, but I felt that this disjointed family may be able to become a united family through this ending. In the halfway of the movie, both Ryuhei and Megumi wished to start their life again because their family broke apart. How can they rebuild their family? Ryuhei made a lot of sacrifices in his life to keep the social system in Japan going. He was working very hard at the company, and he did not have enough times to spend with his family, and he often worked late. He tried to contribute to the society and economy. However, he couldn’t receive enough benefits from the company. Moreover, suddenly he was fired, so he lost his ibasho both in the society and his family. People work hard and contribute to the society, but it is obvious that there are many people who cannot get enough welfares. I think that the traditional Japanese society system should change. 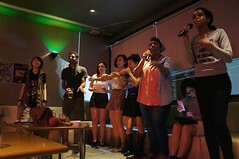 For example, the labors should be guaranteed their positions more in their company. In conclusion, I thought that probably there is a relationship between family and economy through this movie. Many people work hard, and they don’t have enough time with family. From this, the relationship in the family may sour. Therefore, if the economy starts to get worse, the number of families which have breakdown of relationship may increase. In our future, we will depend a great deal on the society and economy. This entry was posted in Precarious Japan: Instability and Youth in 21st Century Japan and tagged Culture of Japan, family, gender roles, japan, japanese society, social change, Tokyo Sonata, work. Bookmark the permalink.